... a tyrolian mounatin village above the town Laengenfeld and the thermal bath Aqua Dome at 1600m, bounded by incredible views on the Oetztal and Stubaier Alps. 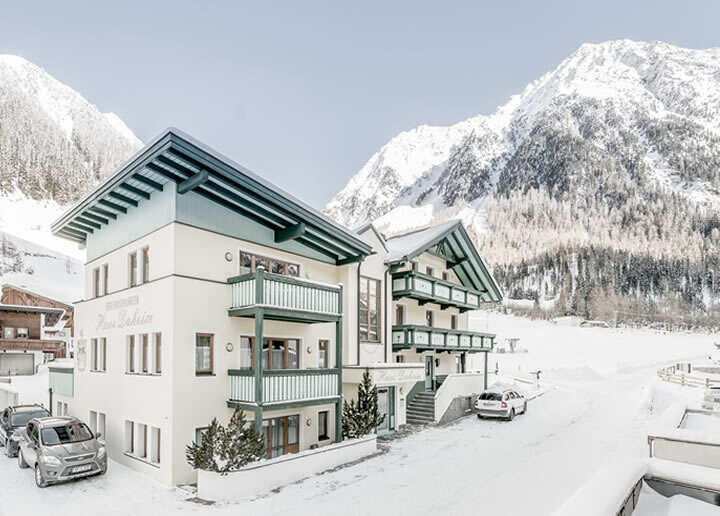 Gries is in the middle of the Oetztal – one of the prettiest and most attractive valleys in Tyrol, with excellent offers for your summer holiday and winter holiday. Every time of the year shows its beauty and invites with many activities and experiences. The best way to enjoy all of that is in an apartment in Laengenfeld! The apartment house Haus Daheim in Gries, offers 11 comfortable apartments with charitable equipment. We keep on renewing our family business regularly, to be able to offer our guests a relaxing place of their own during their stay in your holiday area. We would like to invite you, to spend your prettiest time of the year in our house in Gries close to the thermal bath Aqua Dome in Laengenfeld. Why is an apartment in Laengenfeld so appealing, for your winter or summer hotel? Enjoy the video clip below! Located directly next to the ski lift and slope in Gries! Aqua-Dome-Partner (7 Min. from the Aqua Dome); You receive 10% reduction for tickets at Haus Daheim! Tourist attractions and ski areas Soelden or Oetz in less then 35 Minutes accessable! Smooth temperatures at 1600m in Summer and snow guarantee until April! Experience the impeccable mountain surroundings in Gries and Haus Daheim. An outstanding leisure programme meets all expectations of a breathtaking landscape in Winter and Summer.